Thanksgiving has always been for me a time to be thankful for all the blessings in my life. But How Do We Live Thanksgiving? "The art of thanksgiving is thanksliving. It is gratitude in action. It is applying Albert Schweitzer's philosophy: 'In gratitude for your own good fortune you must render in return some sacrifice of your life for the other life." Thanksgiving is a time to be thankful for all we have, but thanksliving is a way of life that if implemented could improve the quality of life not only for you and me, but for others. 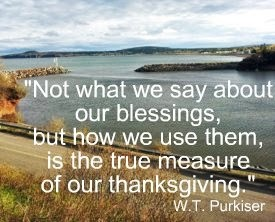 Do you live in a thanks giving way? There are thousands upon thousands of people worldwide that would gladly give up their life to trade with you for your life, a life full of opportunity that just doesn't exist in their world. Each one of these people desperately want a new life where they can live in peace, can work, can feed their families, can bring medical care to their children, can see new life where people are respected and valued and simply not seen as a scourge upon the government. Those of us who are fortunate enough to be born into a country where freedom is guaranteed, where schooling is given and not a dream, where one can move from place to place without fear of being arrested or tortured, or shot dead. We who complain so often are the same ones that have more than can only be imagined by millions of others. We who take for granted what we see and do everyday always wanting more without even the slightest thought that we should have to pay for it or work for it. The simple things we should be thankful for we ignore, the simple pleasures we take advantage of we just assume will always be there. The joy that did not perish. That came not nigh our dwelling. In the US, Thanksgiving always falls on the fourth Thursday of November. In Canada, Thanksgiving always falls on the second Monday of October. While the dates are different in each country, the tradition, the celebration, the giving of thanks is the same.